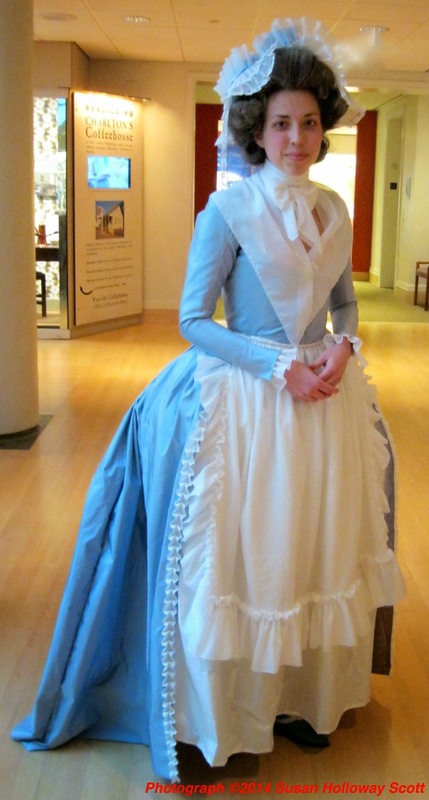 While I was in Colonial Williamsburg last week, I fell in love with this replica pale blue silk gown, left, worn by apprentice mantua-maker Sarah Woodyard during her presentation for the Millinery Through Time conference (another picture here.) Sarah served as forewoman for the gown, directing fellow apprentice Abby Cox, who did most of the cutting, stitching, and fitting. As always, please click on the images to enlarge them. Called an "Italian" gown, the style was popular in the late 1770s through the 1780s, and featured a close-fitting bodice, two-piece sleeves, and a skirt with the fullness gathered to the back. Similar gowns are often seen in 1780s portraits by Elisabeth Vigée-Lebrun like this one, and in drawings like this by Jean-Honoré Fragonard. It's a graceful, flattering gown, without the ungainly width of the hoops worn earlier in the century. But even though hoops had fallen from fashion, something was needed to support those silk skirts from behind. Enter the false rump, or false bum, or derrières, which is just French for much the same. First appearing around 1776, the false rumps were exactly that: two pillow-like cushions that tied around the waist and boosted the posterior to outlandishly large proportions. Some bums were made from cork, while others were stuffed with horsehair or sheep's wool. The false bum that Sarah is wearing is made from linen, stuffed with sheep's wool. Tied over her stays, shift, and petticoat, they look like saddlebags, but under the gown, they make her waist look smaller by comparison, and display the shining pleated silk to best advantage. She reports that sitting in narrow chairs can be something of a challenge. "Derrière begs leave to submit to the attention of that most indulgent part of the Public the Ladies in general, and most especially those to whom Nature in a slovenly moment has been niggardly in her distribution of certain lovely Endowments, his much improved (aridae nates) or Dried Bums so justly admired for their happy resemblance to nature. Derrière flatters himself that he stands unrivalled in this fashionable article of Female Invention, he having spared neither pains nor expence in procuring every possible information on the subject, to render himself competent to the artfully supplying this necessary appendage of female excellence." By the 1790s, the fashion for big bums faded away, as all extreme fashions do. Yet while such styles may disappear, they're usually dormant, not extinct; seventy-five years later, the latest must-have is another form of false rump called the bustle. 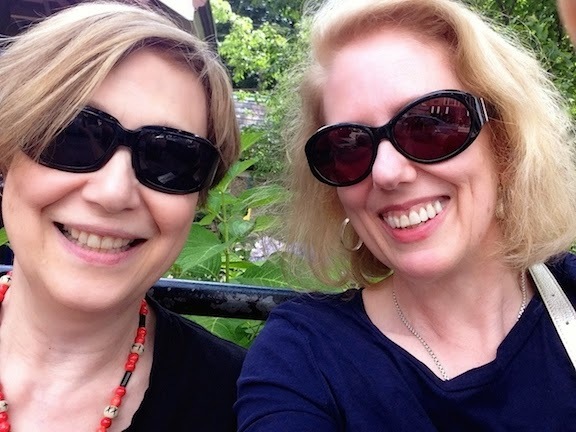 Photographs copyright Susan Holloway Scott. 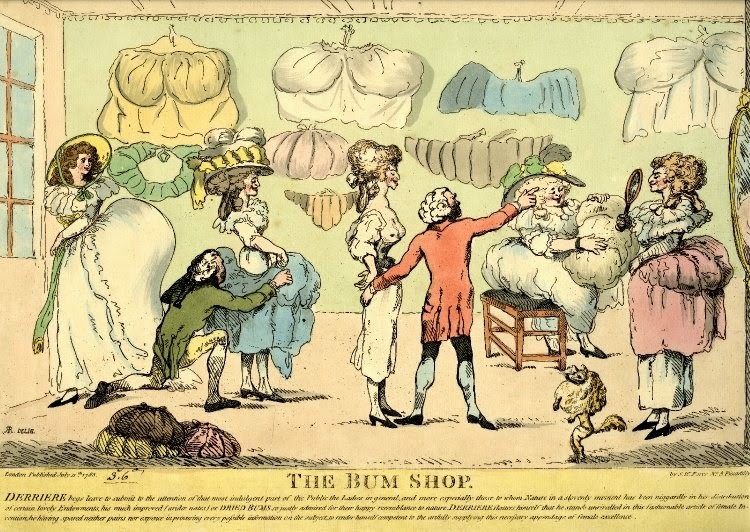 Below: The Bum Shop, published by S.W.Fores, London, 1785. The British Museum. I've had a bum pad that a friend made me for over 10 years. It's stuffed with sawdust. the sawdust gives it just the right weight to hang where I want it.